This is in further response to your letter of December 20, 1990, to the Occupational Safety and Health Administration (OSHA) regarding hazard warning label requirements for crystalline silica under OSHA's Hazard Communication Standard (HCS), 29 CFR 1910.1200. Under the HCS, is the warning label threshold for crystalline silica 0.1% by weight or volume or by respirable portion? If the warning threshold for crystalline silica is 0.1 percent respirable, can you define or cite for us an "approved" method or methods for the measurement of the respirable portion that is applicable to bulk samples. Under the HCS, appropriate hazard warning labels are required for materials containing more than 0.1 percent crystalline silica by weight or volume which have anticipated downstream uses where crystalline silica may become airborne and present an inhalation hazard to employees working with that material. This is due to the fact that oftentimes free silica particles of respirable size are created in the processes (sand blasting, grinding, etc.) utilizing silica particles which initially may be too large to be classified as respirable. A further discussion of OSHA'S position follows. In determining compliance with OSHA's permissible exposure limits (PEL's), 29 CFR 1910.1000, OSHA industrial hygienists collect and analyze personal breathing zone samples taken during the course of an investigation to determine employee exposure to airborne levels of respirable silica. These samples collect the respirable fraction of the total dust to which an employee is exposed in the workplace air during the employee's normal course of duties, and as such, represent a measurable quantification of the airborne concentration of respirable silica. If OSHA were to find worker exposures to crystalline silica in a workplace and the product from which the exposure resulted was not labeled in accordance with the requirements of the HCS, a violation of 1910.1200 would be alleged. Sand blasters should have a complete supplied air respirator system like this one from Safety Emporium. However, the requirement to transmit information under OSHA's HCS is not tied to downstream exposure amounts (with the exception of subparagraph (d)(5)(iv) that, even if a carcinogen is present in a mixture in quantities less than 0.1 percent but could still be emitted in a level above an OSHA PEL, then that mixture must be assumed to present the same hazard as that hazardous component). OSHA's newly-revised compliance directive for the HCS, CPL 2-2.38C, issued October 22, 1990, provides further clarification, and is enclosed for your reference. Statements made by OSHA regarding crystalline silica referred to the Agency's method of establishing compliance as just described. The HCS is based on the potential for exposure to a hazardous chemical, and in the case of crystalline silica, exposure can only occur when crystalline silica is present in respirable form. While OSHA does not take bulk samples of products to analyze for respirable crystalline silica, our Analytical Laboratory has confirmed that there is no validated method to perform such an analysis. If employers were to use such a determination to avoid labeling their products, a validated method would have to be followed. Furthermore, as you know, handling and processing of many products that contain only large-sized particles of crystalline silica may generate respirable particles in the workplace. If OSHA were to find that workers are exposed to crystalline silica in respirable form from use of such a product in the workplace, a violation of the HCS would be alleged despite the bulk sample analysis. For all practical purposes, therefore, the requirements of the HCS to provide an appropriate warning label, apply to products containing greater than 0.1 percent crystalline silica or total quartz by weight or volume, as determined by analysis of a bulk sample of the original product. If the manufacturer has objective evidence to indicate that exposures to respirable silica would not occur when the product is used then this may be factored into the determination of an appropriate hazard warning. For example, we are aware that manufacturers of wallboard products that contain crystalline silica have taken numerous measurements during use of their products, and no respirable crystalline silica was detected. They have decided not to label based on this evidence. We hope this clarifies the concerns you raised. please feel free to contact us again if we can be further assistance. This is an interim response to your letter of December 20, 1990, to the Occupational Safety and Health Administration (OSHA) regarding hazard warning label requirements for crystalline silica under OSHA's Hazard Communication Standard (HCS), 29 CFR 1910.1200. In order to more thoroughly address your concerns, we are in the process of gathering information in order to develop a detailed response to your letter. We will be providing you with a written reply shortly. In an effort to comply with the Hazard Communication Standard (HCS) we are requesting your "official interpretation" regarding hazard warning label requirements for crystalline silica. Although our workplace is directly regulated by MSHA, our clients, distributors and customers require our compliance with the OSHA HCS. 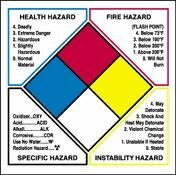 We understand that the HCS requires manufacturers to place warning labels on containers of hazardous chemicals that contain 0.1% or greater, of a carcinogen or potential carcinogen, if there is potential for exposure to the chemical under normal conditions or in foreseeable emergencies (29 CFR 1910.1200 (d)-(f)). We further understand that products containing 0.1% or greater crystalline silica require warning labels for potential occupational exposures because crystalline silica has been classified as Group 2A by the International Agency for Research on Cancer (IARC), (Monograph No. 42), one of the "established sources" under 1910.1200(d)(4). During the past year we have observed that OSHA officials have made statements to the effect that hazard warnings are not required if the respirable portion of crystalline silica in a dry mineral products is less than 0.1%, despite a total crystalline silica content of greater than 0.1% by weight or volume. We have also learned that other firms have reportedly tested their mineral products for respirable silica content, found less than 0.1% by some measure of the "respirable" portion and have subsequently removed their hazard warning labels. Under the HCS, is the warning label threshold for crystalline silica 0.1% by weight volume or by respirable portion? If the warning threshold for crystalline silica is 0.1% respirable, can you define or cite for us an "approved" method or methods for the measurement of the respirable portion that is applicable to bulk samples. To the best of our knowledge, there is no generally accepted analytical method to accurately identify and quantify the respirable portion of crystalline silica in bulk samples at the low concentration of 0.1%. We are aware of OSHA permissible exposure limits, however we have no way to control our customers' use of our product or potential exposure, thus it appears that we must test bulk samples of our products for their silica content. The recent new interpretations of OSHA HCS warning requirements for crystalline silica and subsequent actions have caused confusion. We see the lack of product warning labels being used as a marketing tool at the expense of a consistent HCS. The safety of workers must be of first importance and to achieve this requires a clear and uniform interpretation of the HCS with regard to crystalline silica. Your assistance with our compliance efforts is most appreciated and we would be happy to answer an questions you or your representative may have on this matter. 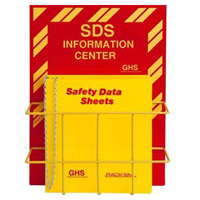 Ensure that your MSDS collection is readily accessible with these handy compliance centers from Safety Emporium.